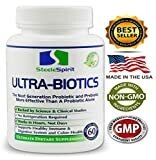 #1 Best Probiotic & Prebiotic Supplement. Ultra-Biotics; A Premium Once Daily, Dr. Recommended Probiotics Supplement For Complete Digestive & Immune System Support. 60 Delayed Release Caps. #1 Best Probiotic & Prebiotic Supplement. Ultra-Biotics; A Premium Once Daily, Dr. Recommended Probiotics Supplement For Complete Digestive & Immune System Support. 60 Delayed Release Caps. (UPC 092617930986) is sold at the following online stores. We've find the latest prices so you can compare prices and save money when making your purchases online. Please click on the links below to browse to each store's webpage.